At times this blog has seemed largely to be a catalog of loss — it’s been that kind of year. Among the losses I wrote about early on was the departure of our beloved minister, Bert Keller (with whom Susan shared a pulpit for 3 years), and his wife, Lucille. Spiritual beacons, deep-thinking teachers, gentle wise souls, dear friends and pretty good drinking partners. They fled old Charleston for even older Wooler, England, tucked way far away in the distant corner of North Northumberland — land of moors, horse pastures and sheep. In the void where their physical presence was, words have spilled in and expanded, filling the emptiness. Big, lovely, voice-drenched words. Lucille’s words, her distinct voice, via emails that are the best damn travel writing I’ve read. Stories of people and customs in their new small town, of the tiny country churches where Bert now pastors, and most recently, a story of an anniversary dinner with their friends Doz and Joyce, and the witnessing of the small blessing and earthy work of a country shepherd. “ Oh, what hard work Doz has tending 1200 sheep singlehandedly—I want to begin listing it all, but it would take all night and I wouldn’t scratch the surface. Man, there’s so much more to being a shepherd than sitting by a brook and composing Psalms! Most of the sheep are up on the other farm, where the lambing will take place and he has facilities all ready with sheds prepared with individual lambing pens, and holding pens to move them to. As soon as it starts, he’ll move up there with them and just sleep right there on the hay with them til all the lambing is done. Ready to step in and help if any ewes have difficulty. As we stood there looking at her, Doz began to revise his estimate. He said, “Look at her, you can tell she’ll lamb soon by the way she’s acting. It may be in a day or two.” We kept looking. She began pawing the hay-covered ground. Doz said that was an early sign. Then he said, “Watch her head.” She began to lift her head high in the air, stretching her neck. She began to bleat. “She’s lifting her head to strain. She’s talking to her lamb. Well, she may lamb tonight.” I couldn’t believe it! We ran up to the house to give Joyce and Bert the news, Doz put logs on the fire and Joyce dipped up plates of roast turkey & gravy, roast potatoes, roast parsnips, balls of dressing, sausages wrapped in bacon, carrots, beans, new potatoes, and broccoli. Doz had cleared his plate before we were half through, trotted off back to the barn, and returned a few minutes later to say that the ewe had had the first one, which was—unfortunately for him—a female (he’d planned on this one being a prize ram). I couldn’t get my Wellies on fast enough. Bert joined us this time and brought his camera. What a thrill—there she was, just struggling to stand, bleating little high-pitched baas, with mother answering, then within a minute wobbling all over the place! Doz determined that there wasn’t another (they usually come in two’s) and he decided to fence off an area just for mother and lamb so all the other curious sheep wouldn’t crowd them out and damage the little one. Doz let me pick up the wet and wooly little newborn and put her in the private pen. He says she’s not as heavy as he’d like her to be, but she has beautiful, perfect ears—the mark of a show sheep. We walked in the full-moon light back up to the house, back out of Wellies, and sat down to a fabulous dessert of trifle, tea, chocolates, and great conversation by the fire. I’d like to explain this high I’m on tonight. 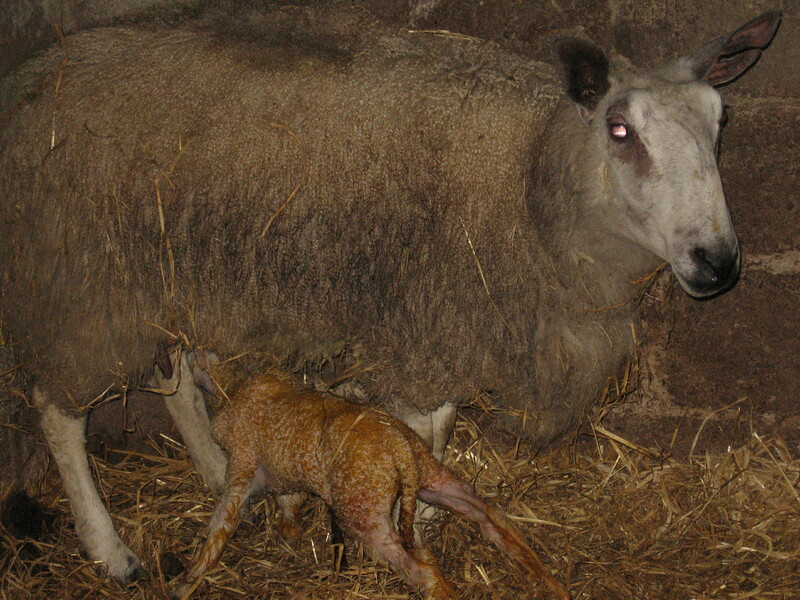 Yes, it was thrilling to see a newborn lamb, but that’s not all of it. 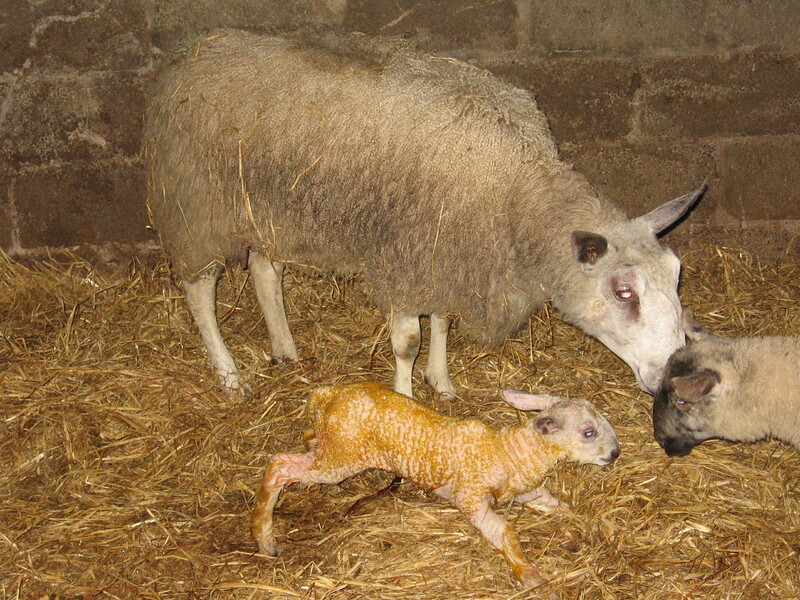 I’ll get to see them actually being born when the proper lambing starts. But there was some kind of magic to it tonight. It was a surprise, unexpected. We saw a mother doing what comes to her instinctively—moving away, pawing the ground, straining her whole body, calling to her unborn. And something more. This magic happened in these ancient hills, at an old stone farm in England, with a shepherd who is part of a dying breed of men. There’s little money in wool anymore, and mechanization has made it possible to employ fewer people for large jobs. In the old days a shepherd was expected to care for no more than a few hundred sheep. There were many shepherds then. Now they are expected to care for one or two thousand. New apprentices are not being trained, and shepherding is a dying art. Yes, it is an art. And the magic happened with friends, folks whose musical Northumbrian accents are my own heart’s psalms. ~ by Stephanie on 03/28/2011. Isn’t she amazing? I feel like I am there. Lambing, yes. What a wonderful story for this spring season. Pass the trifle please. Beautiful. Thank you, Stephanie, for giving me a glimpse of the world through your eyes (and the eyes of Lucille).